Dhirajlal Hirachand Ambani, one of the leading Indian businessmen, was born on December 28, 1932 in Chorwad, Gujarat. 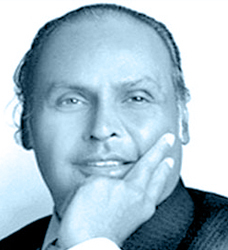 Popularly known as Dhirubhai Ambani, he heads The Reliance Industries, India's largest private enterprise. Dhirubhai started off as a small time worker with Arab merchants in the 1950s and moved to Mumbai in 1958 to start his own business in spices. After making modest profits, he moved into textiles and opened his mill near Ahmedabad. Dhirubhai founded Reliance Industries in 1958. After that it was a saga of expansions and successes. Reliance, acknowledged as one of the best-run companies in the world has various sectors like petrochemicals, textiles and is involved in the production of crude oil and gas, to polyester and polymer products. The companies refinery at Jamnagar accounts for over 25% of India's total refining capacity and their plant at Hazira is the biggest chemical complex in India. Dhirubhai has been one among the select Forbes billionaires and has also figured in the Sunday Times list of top 50 businessmen in Asia. His industrious nature and willingness to take on any risk has made him what he is. In 1986 after a heart attack he had handed over his empire to his two sons Anil and Mukesh. His sons are carrying on the successful tradition of their illustrious father. Dhirubhai Ambani was admitted to the Breach Candy Hospital in Mumbai on June 24, 2002 after he suffered a major "brain stroke". This was his second stroke, the first one had occurred in February 1986 and had kept his right hand paralyzed. He was in a state of coma for more than a week. A battery of doctors were unable to save his life. He breathed his last on July 6, 2002, at around 11:50 P.M. (Indian Standard Time). Dhirubhai Ambani started his long journey in Bombay from the Mulji-Jetha Textile Market, where he started as a small-trader. As a mark of respect to this great businessman, The Mumbai Textile Merchants' decided to keep the market closed on July 8, 2002. At the time of Dhirubhai's death, Reliance Group had a gross turnover of Rs. 75,000 Crore or USD $ 15 Billion. In 1976-77, the Reliance group had an annual turnover of Rs 70 crore and Dhirubhai had started the business with Rs.15,000.